Damage basically shows how much potential this new band has. 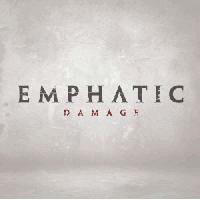 Hailing from Omaha, NE, Emphatic is a bit of a fresh breath in the mainstream rock category if you ask me. This album shows that bands can still stay true to their heavy routes and not have to compromise their sound to become big *cough cough* Nickelback. Speaking of them I would compare Emphatic to a mix of Nickelback and Daughtry, but blowing both of them out of the water. The vocals fit the songs very well, wheter slow and heartfelt or raspy and raunchy. There is some pretty damn catchy guitar work here too (opening of "Get Paid"). All in all, a very good debut from a band that has gobs of potential as long as they keep doing what they're doing. They were the opening band for Alter Bridge on their 2011 summer tour. I was impressed with their sound so I met the band afterwards and purchased their CD at the event. They put on a very good live show and believe they have lots of potential.